If you’re a beer connoisseur than you’ve probably wondered a bit about the history and alcohol content of whatever random beer you’ve chosen off the tap. 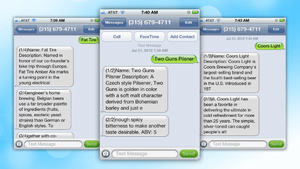 BeerText.Us is an incredibly simple tool where you text message a beer’s name, and get a full description as a reply. All you need to do is text message the name of the beer you’re curious about to (315) 679-4711. Within a few seconds you’ll get a reply that details the beer’s history, the ingredients used, and the alcohol content. We had mixed luck with a few different imported beers, but overall BeerText.US delivers information for most American beer brands and it’s a lot faster than trying to search for that information in your browser. BeerText.Us should come in handy if you have an allergy, or if a bar doesn’t have descriptions of its beer selection. As you’d expect, normal text messaging rates do apply. If starting with a new, unused gourd you have to prep it for use. First moisten the inside of the gourd with a bit of water. Then use a spoon or the bombilla to gently scrape out any loose bits from inside of the gourd. Then fill 1/2 full with yerba mate.? ?Fill with hot water. Allow to sit, filled, for 12 hours. Dump the water and tea out and allow to air dry overnight (or if you are in a humid climate, a full day) until it is completely dry. Repeat this process twice. When your gourd is ready fill it 1/3 full of yerba mate. Cover the opening with the palm of your hand. Tap the bottom of the gourd with ? ?your other hand. Wet leaves with about a tablespoon of cool water. This is said to help keep the mate from “bruising” and my husband says when he does this step, the mate does seem to taste better*. Fill with hot water. Pour the remaining water in your thermos. Once the gourd is empty of water fill with hot water from the thermos and either enjoy it yourself or pass to a friend. Repeat until all of the hot water is gone. When finished, dump out the damp mate. Rinse the gourd and allow to air dry upside down over a rack. This will prevent your gourd from becoming moldy. There is no need to prep your gourd again. *His hypothesis? It prevents the first gourdful from being overly bitter. I was excited that Bravo’s ?? ?Around the World in 80 Plates” will be in Argentina this week (July 11th, 10/9c) because it would be the perfect excuse to share how to enjoy the national drink of Argentina, mate. My husband, Matt, has been drinking mate from the traditional gourd using a bombilla (straw) since before I met him. He happily shared with me his technique of readying your gourd before the first use and the proper way to enjoy mate. When he first starting drinking mate after reading about it in a novel, he had a difficult time finding English language instructions on how to prep your gourd and how to drink mate. He eventually figured it out and now has a work gourd and an at home gourd! It is a bit of effort but it is worth it. There is no wonder yerba mate is so wildly popular in Argentina that at??certain? ?times of the day the work halts for a mate break! A note about sourcing: There are several places online that sell gourds and bombillas. We’ve had the best luck at Gaucho Gourmet. We are able to buy the tea at our local Italian (!) grocery but that too is available online. All recipes, text and photographs on Coconut & Lime are the original creations and property of Rachel Rappaport and are for personal, nonprofit use only. Do not post or publish anything from this site without written permission from the author. E-mail me (coconutlimeblog @gmail.com) with any questions. “The Persecution and Assassination of Jean-Paul Marat as Performed by the Inmates of the Asylum at Charenton Under the Direction of the Marquis de Sade” is a play written by Peter Weiss, whose conceit is that a group of inmates in a post-revolutionary French insane asylum are talked into acting out a subversive denunciation of the revolution’s betrayal by the Marquis de Sade, who is a co-inmate. And it’s a musical. My parents loved this one, and we sang the songs in the car. I’ve seen several productions, including the 1967 film of a live performance. It turns out that this whole film is online on YouTube, all two hours’ worth. It’s quite an amazing work, and the YouTube version is subtitled in English, Portuguese (Brazilian), French, Spanish and Turkish. The Marquis de Sade is locked in the Charenton mental hospital and decides to put on a play. His overseers agree as long as he follows certain conditions. He writes and directs the other mental patients in a play based on the life of the Jean-Paul Marat. As the play progresses, the inmates become more and more possessed by the violence of the play and become extremely difficult to control. Finally, all chaos breaks loose. Have you ever been annoyed to find that your Mac won’t got to sleep when you tell it to? It turns out that in Mac OS X 10.6 and later, there’s a simple way of finding out what’s keeping your Mac awake. In the first section of output, you’ll see the status of two kernel assertions named PreventSystemSleep and PreventUserIdleSystemSleep. An accompanying status of 1 for either of these means that it is currently triggered. The second section of the output lists the processes which owns any enabled assertions, both by process id (pid) and bundle id. If the verbose bundle id doesn’t ring a bell, you can always use ps up <pid>, or look in Activity Monitor, to find the name of the exact command associated with this process.